A first device, named “impulse device” stores the electrostatic energy present in the atmosphere at the approach of a stormy cloud and releases the excitation of the ascending discharge at the right time.A second device, named “power device”, collects and stores the wind and / or the solar energy in several strong power capacitors. The Saint-Elme lightning conductor is in this way permanently pre-loaded of an important energy which enables him to support the propagation of the ascendant tracer. Close to the storm activity, an integrated sensor measuring the surrounding electric field value, releases the impulse device like most of usual Earlu Streamer Emission systems. Those lightning conductors almost immediately reverse the polarity of their head, creating a sudden amplification of the electrical field.The innovation of “Saint-Elme Active 2D” Lightning conductor comes from the use of a second integrated sensor which measures the intensity of the electric discharge current, which is formed on the lightning conductor’s head. When the downward leader enters in the protection area of the lightning conductor, the measured current strongly increases. As soon as this current is higher than the characteristic threshold, the power capacitors discharge and release the necessary energy for the propagation of the leader.In this last device, the lightning conductor’s head acts as a capture device. Therefore, the head is electrically insulated from the ground. 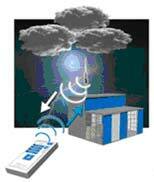 • Maintain the propagation of the tracer by discharge of the power device. • Consider the cloud polarity. • Radius of curve of the head optimize to reduce the corona effect and guarantee the excitation device. • Protection of the electrical part against the rain with a dimensioned flange. • High quality materials, esthetical. • Use of stainless steel to resist against corrosion. Simple and fast, the test does not require any particular operation of dismounting of the lightning conductor and can be done safety from the ground.